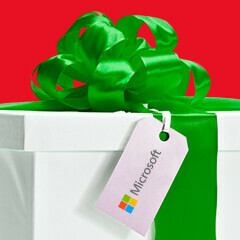 Microsoft today kicked off its 12 Days of Deals holiday campaign which, just like in the previous years, offers deals on various products - including Windows-based tablets, phones, and laptops. Available only in the US and Canada, the campaign started with Microsoft offering the Toshiba Encore Mini Windows tablet for $79 (instead of the $99 regular price). Unfortunately, the tablet is now sold-out, but many other deals will be waiting for customers in the next 11 days. Tomorrow, December 9, Microsoft will sell the Blu Win HD smartphone for $129, thus taking $50 off its regular $179 price. The Blu Win HD - pictured below - is certainly a decent handset, running Windows Phone 8.1, and sporting a 5-inch 720p display. Other features include an 8 MP rear camera, 2 MP front-facing camera, quad-core Snapdragon 200 processor, 1 GB of RAM, and 8 GB of internal memory (expandable thanks to microSD card support). At the moment, Microsoft doesn’t mention the products that it’s going to offer as part of the promotion in the following days. However, all deals will be revealed in due time, and you can check out Microsoft’s website at the source link below for more details. Nah not even close. This is a poor imitation. I don't have a problem with taking some design elements though, but this Blu Win HD is poorly made (just like most BLU's smartphones). It feels like one on the Lumia 530. The display is also similar to the 530 in term of build, not very solid. The Lumia 635 feels much better, and the Moto G 2013 I have (same price range with that Win HD) feels super solid in comparison with a much more solid back and a very well build front panel. I've been to the Microsoft store to try both this and the BLU Win Jr. and I would say the BLU Win HD shouldn't have cost $170 at all. I just wanna add that at $120 (or at $100 on amazon a few weeks ago), it may be worth a try, but only for those who have money to spare and wanna experience with BLU phones or Windows Phone at low cost. For those who have a tight budget but needs a smartphone that lasts, I would most likely recommend the Lumia 635, Moto E, or maybe even the Lumia 521 which may be older but also much cheaper. Seems good enough for those who missed the deals on Amazon a little while ago. This phone was $100 for about a week there. I wonder what deals lay ahead though. Wish they just showed everything, lol. Last few years the lost has leaked. Bummer that MS is better at keeping secrets. In Malaysia, we got a Christmas promotion for Lumia 535 dual sim at the price of 123.51 US Dollar, which include 16GB (Class 10) SD Card, 3000MHZ Powerbank, a note book....? and a key chain, actually it kinda good deal. They had a little of everything last year. XBOX gaming, XBOX Music passes, a couple different WPs, a bunch of tablets, just a bunch of options.